The Philippines will be back at Waterloo After a string of successful spring and summer experiential events including the highly successful Rail Station Dominations and the Philippine Tourism Weekend at Potter’s Field, PDOT is closing its consumer activations for the year by returning to Waterloo from 17 October to 10November. Visitors dropping by Waterloo from 17 October can expect to see Philippine branding splashed across the Waterloo Motion, Europe’s largest advertising screen at 80 metres wide and twelve D6 HD screens around the station for an entire month. Along with Philippine branding,special promotional offers for flights and holiday packages to the Philippines are advertised by PDOT London’s partners including Philippine Airlines (with return fares of £398 all inclusive to Manila from London), STA(with return fares of £399 to the Philippines), Explore (with £200 their Holiday Package), Dive Worldwide (with their 10-day dive holidays from £1,995.00) and Secret Escapes. 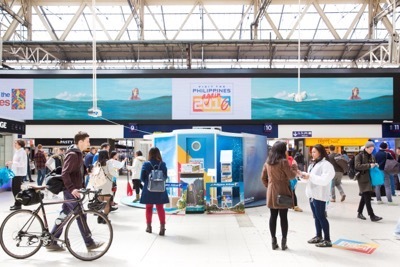 Then from 4-10 November, the Philippines will have its experiential zone present at the centre concourse of Waterloo Station where visitors can win a holiday to the Philippines by taking paddle boarding or sky cycling selfie photos and uploading these to social media or entering through our IPADs. Visitors can also check out 360-degree imagery of the Philippines’ top destinations and walk away with exciting prize giveaways. Joining the Philippines’ activation zone will be Philippine Airlines promoting their special fares to the country.